How Does the Brain Create God – and in which ways? 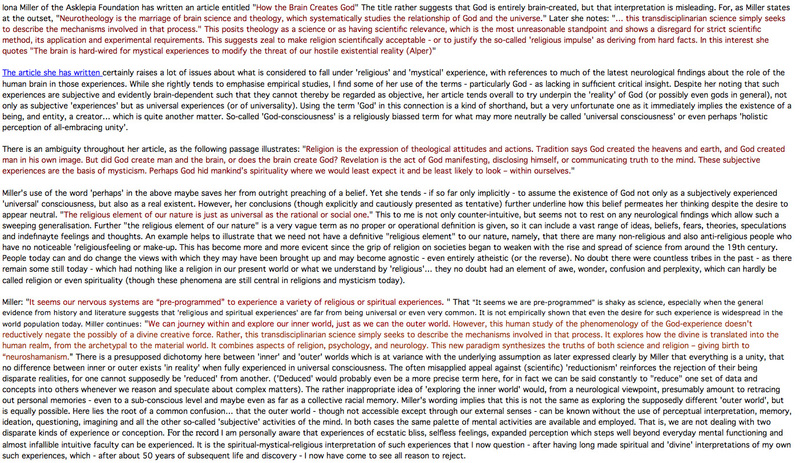 1) Iona Miller article “How the Brain Creates God” suggests that God is entirely brain-created, but that misleads as to her main purpose, to instate the religious impulse and mystical experience (of God, unity, whatever…) as fundamental to the human brain. Strict Nuns get IT help with their prayers? Gareth Mitchell of the BBC World Service programme Digital Planet (10/08/2010) presented one of the most hilariously ridiculous reports that I have heard. It was about a community of nuns – the aptly named ‘Poor Clares nuns of St. Joseph’s in York – which have had a digital dot matrix display designed and made for them (in the shape of a chalice or a candlestick candle with a text display on top) that gives a news feed of global events and updates of the emotions and feelings of bloggers around the world. For the last 18 months the Poor Clare’s nuns have been using this internet portal to help “guide their prayers”. They have taken vows of chastity, poverty and enclosure, but they reportedly “intercede in the world” through prayer. Bill Gaver from Goldsmiths, London, which made the unobtrusive device suitable to the “meditative environment” explained how these nuns have taken vows of social isolation which Goldsmiths tried their utmost to respect. However, the nuns needed up-dated information on who and what to pray for, hence the digital device which is prominently displayed in their prayer hall. The screen displays results from keywords like ‘feel’, hoping that the nuns will learn what people in the real world are feeling. Some of the results were evidently not so illumining, like ‘I feel good’ (doubtless also less expected postings like ‘I feel like a few beers’ or ‘Why the devil do I feel like a good ****?” and so on). In short the presenter and Bill Gaver made complete asses of themselves in expounding the great benefits that can be expected from this innovation in glowing terms as subtly non-invasive of their privacy and not least their self-condemned total isolation from the world. Unfortunately, though, the publicity about it had led to journalists knocking at the monastery doors… and the nuns had – surprisingly (?) also let some in to take photographs! The “unobtrusive but effective” innovation, of which the designer said he was very proud, was said to help the nuns not to just impose their own views in sending their prayers to the ‘higher plane, as it were’, the one which is really effective! He claimed “they are changing the way God looks at people who are unhappy”. So are they instructing God too, as being out of touch with things? Why bother with the Internet. Why not just pray to God to do the right thing whoever, wherever, whatever? Can’t he (she, or it) manage to figure the message? Oddly, the presenter reported that the nuns had already got themselves a computer so as to get on-line (in addition to their traditional use of the radio). This incredible satire was amusing, if nothing more. Why can’t the nuns pray for the victims of Pakistan’s floods, China’s mudslides, Russia’s drought and have done with it all so effectively?